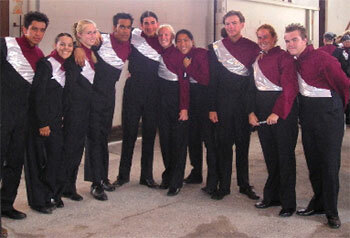 Mike Chavez (blinkbuddy@hotmail.com), a 2003 Esperanza front ensemble member from San Diego, submitted this one: "This picture of the 2003 Esperanza front ensemble was taken right when we stepped off the field at Division II & III finals at the Citrus Bowl. From left to right is Adrian, Evelyn, Julie, Me, Montana, Nikki, Grace, Karl, Jenny and Chris. We were all very excited by the first-place performance we turned in, and knew this was the last time we would ever perform our show together. I made fantastic friendships through Esperanza and it was an amazing experience that I can't wait to start over next season."